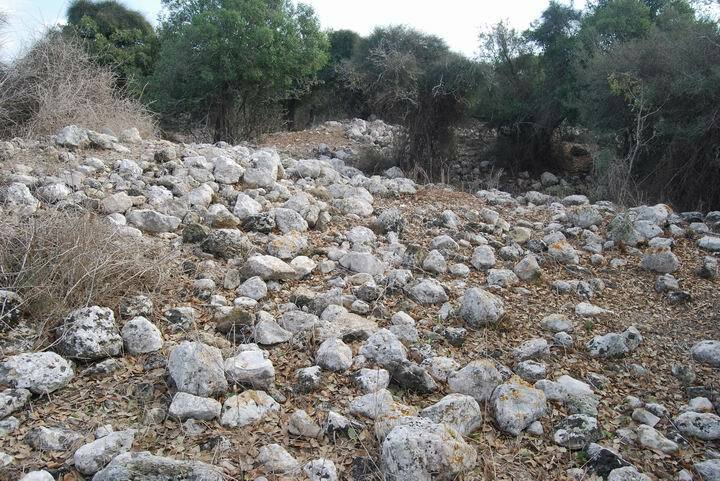 Excavations on the eastern slopes of the hill show that the lower side of the hill, near the creek, were inhabited on a small scale in prehistoric and Biblical times : Middle Bronze, Israelite and Persian periods (20th C BC through 5 C BC). The ancient village was established on the hill in the Roman period. The village prospered from the trade road from Sepphoris that passed at its foothills and its residents farmed the fields along the fertile valley of the Zippori creek. As most of the sites in the Galilee, the village was destroyed in the Arab period (7th C AD) and remained in ruins since then. Today the site is in ruins. 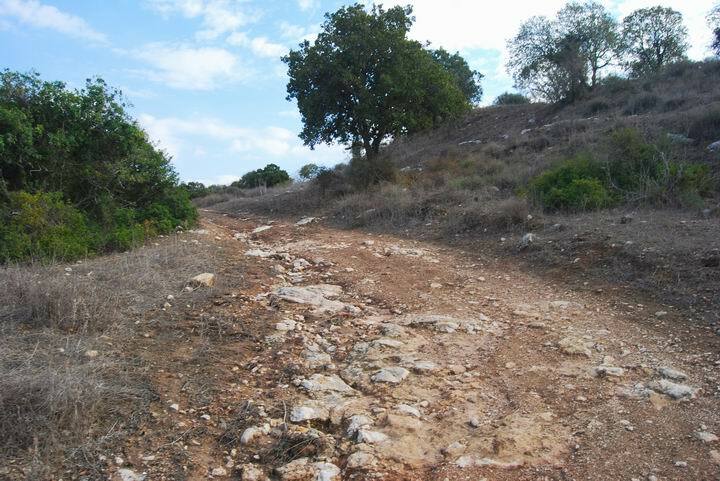 The Keren-Kayemet prepared a 1.7KM walking path (Zippori path) that starts at the small parking lot adjacent to the foothill where the site is located. A modern residential community has been established in 2001 with over 500 families, about 1km south to the site. It was named after the ancient site - Shimshit. Kibbutz HaSolelim was established in 1949 on the hill west of ancient Shimshit. The ruins are accessible from the road from Hamovil junction. Turn east towards Nazareth, take the first turn right to Kibbutz Hasolelim, and after about 100M turn left to new Shimshit. After 200M there is a turn left to a small parking lot at the foothill of the ancient site. You can start walking through the paved path, but then walk up the hill. The ruins are located on the hill at a height of 230M, about 70M above the creek. The Zippori creek bends around the hill of Khirbet Shimshit. This aerial view by the quadcopter shows the site from the north side. 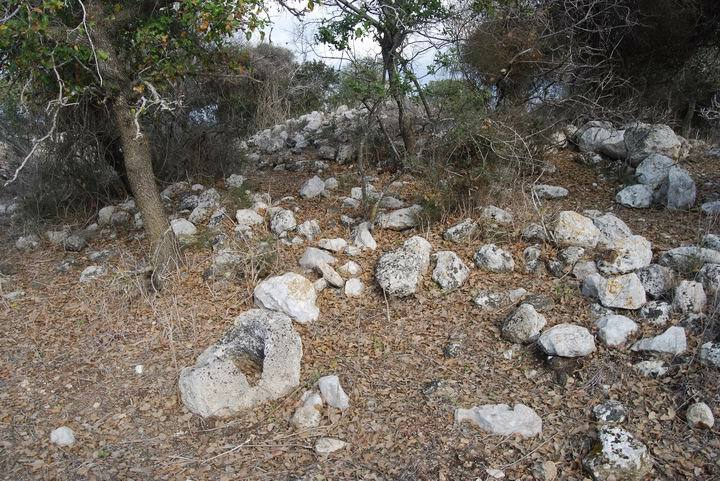 The ruins are located on top of the hill, and a dirt road leads up from the parking lot up to the center of the site. The following panoramic view shows the north side of the ancient village, with a view towards Sepphoris. The creek flows, during some of the winter season, from the right to left. The green patch in the center marks the path of the creek. 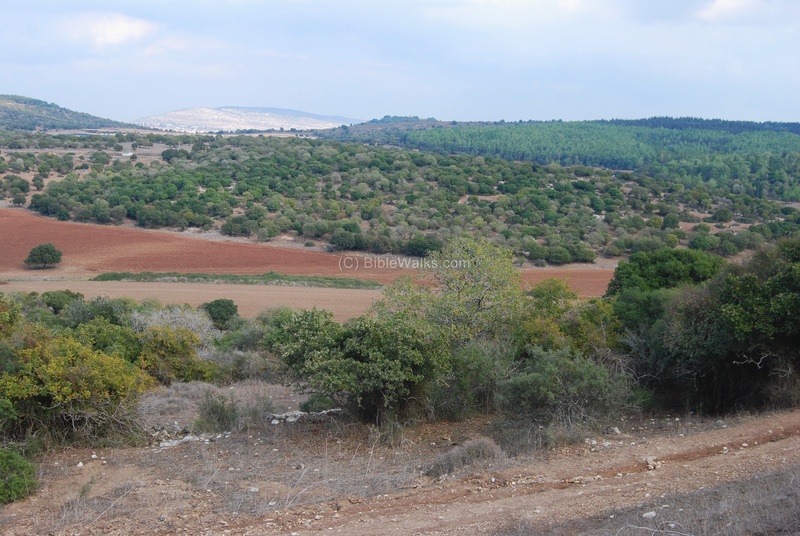 On the left side is the eastern edge of Kibbutz Hasolilim. A detail of the center of the panoramic photo. Sepphoris is seen in the center background on top of a hill. The Roman road passed near the foothill on the left side, crossed the creek where the left tree is located, and then at a direct line towards Sepphoris. 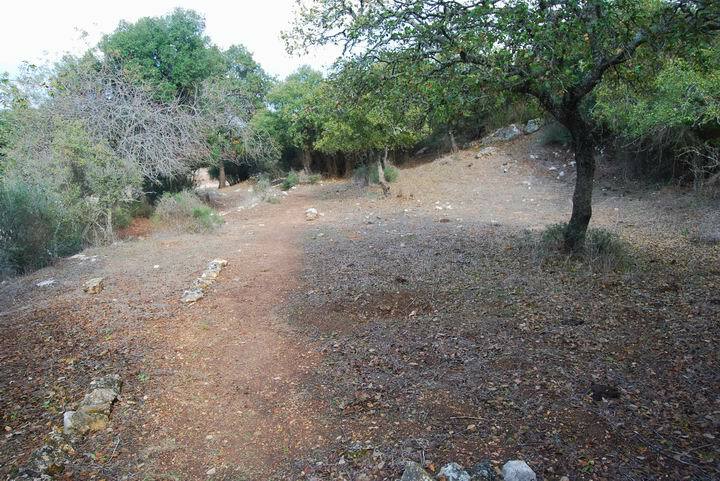 The Roman road traversed the foothills on the western side, and a section of that road is seen below, although it is partially covered by the leaves. A 12M section of the 6M wide road was excavated (see report). 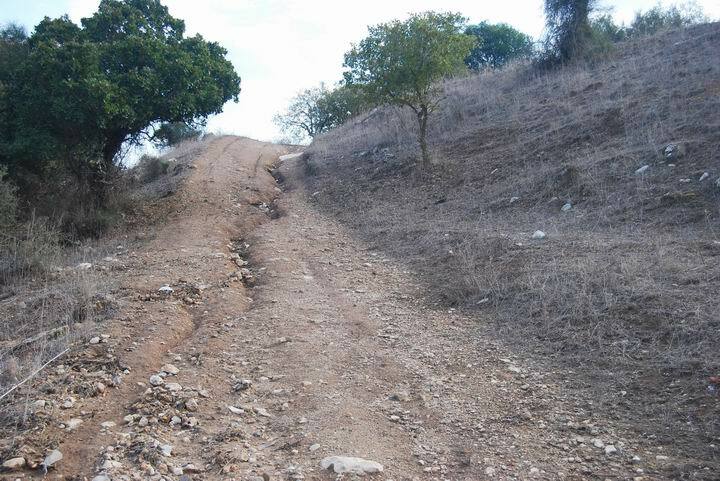 The road was composed of a floor covered with small stones and pebbles. On its north (right) side there are two rows of stones, laid side by side: larger and medium stones (0.55-0.3M) on the exterior, and medium stones on the interior. A large Roman milestone once stood here several years ago. It had an inscription bearing the name of the emperor when the road was built. This was the 14th Mile on the road from Legio (Megiddo) to Sepphoris, and its number was also inscribed on that milestone. The photo below shows the same section from the south side. Another Roman road branches and climbs up the hill to the village, as seen in the following photo. The northern walls of the ancient village are seen on the right side. Another section of the entrance is seen below, with the northern walls on the right side. On top of the hill are the ruins of the Roman/Byzantine village. There are 2-3 dozens houses, which were not yet excavated. Other ruins are seen below. A broken stone with a hole, seen on the bottom, was a part of an olive press installation (the weight). Shimshit - from Hebrew? Shemesh means "sun". Hasolelim - from Hebrew: Solel is "pave", so the name loosely means "those who pave the path of the agricultural settlement"
Khurvah (Horvah, Horbah)- Ruined site in Hebrew; Khirbet in Arabic. Biblical references: Leviticus 26,31: "And I will make your cities waste,...". Isaiah 44, 26: "...and I will raise up the decayed places thereof.